Click here to see other views of this same scene. Yes!! I can imagine myself there--it's a great picture. I always look forward to seeing what you will share with us. Thanks! 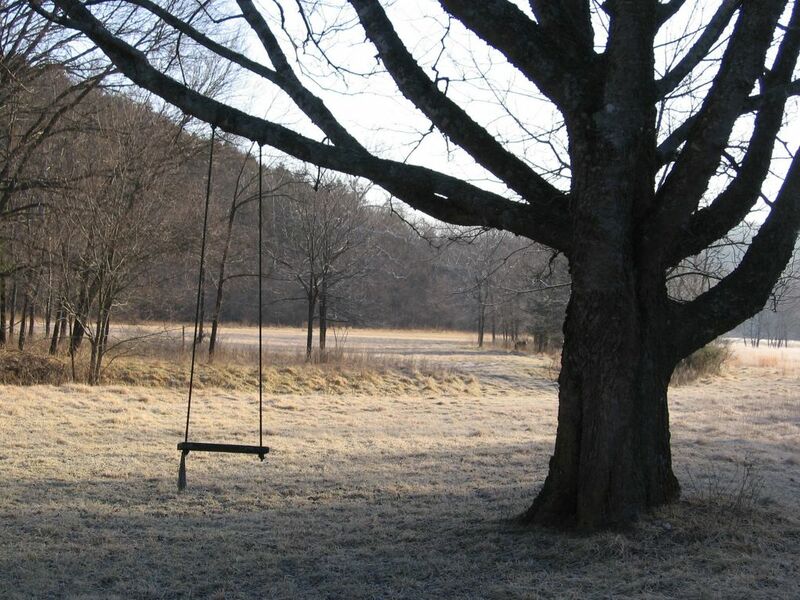 There's nothing in the world like a tree swing. Had one as a kid. Wouldn't mind having one now. ahh...the memories that evokes. 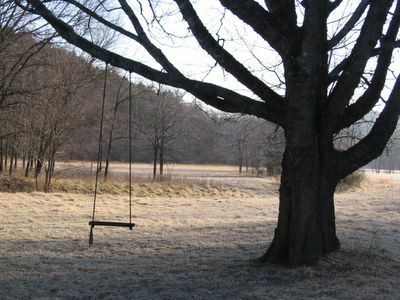 I can smell the new grass and hear the spring peepers. What a beautiful reminder of how spring is almost here! Lovely! good contrast!!! Great idea to do something like this! Jeffy, my boy-You will not see chickenz on that thing, and I will tell you why. As FG pointed out in a less relevant context (the perfectly reasonable request for an armchair) we don't have arms! Operation of that swing device without arms is not recommended. We heard the first peepers the other night! They had us surrounded, as there are puddles everywhere from all the lovely rain we've been having. But the same thing happens every year: early peepers fill the night air, late heavy freeze (snow predicted this weekend), sound of silence prevails. It's always sort of sad, but they do manage to make a comeback once it warms up again. I swear the first day of winter was just last week. Time flies! Great to hear from you. I've been loving these Same Scene, New View photos. I fall into the same trap many people do--we 'look' around us, but we don't 'see.' These photos are making me really see how much my landscape changes--and how quickly sometimes. Whitey on the swing would be priceless. Can't you just see it on a t-shirt? I guess that explains why you and Whitey (and all your feathered friends now roosting in that great henhouse in the sky) have NEVER EVER used the wonderful little swing Joe built for you in your chicken run. Not once. We were very disappointed. We even thought maybe you only swung on it when we weren't looking. But now that you've brought up the lack of arms thing. . . Plus a while back we decided that the author of the chicken book who suggested building the swing (what? you think we came up with the idea ourselves? 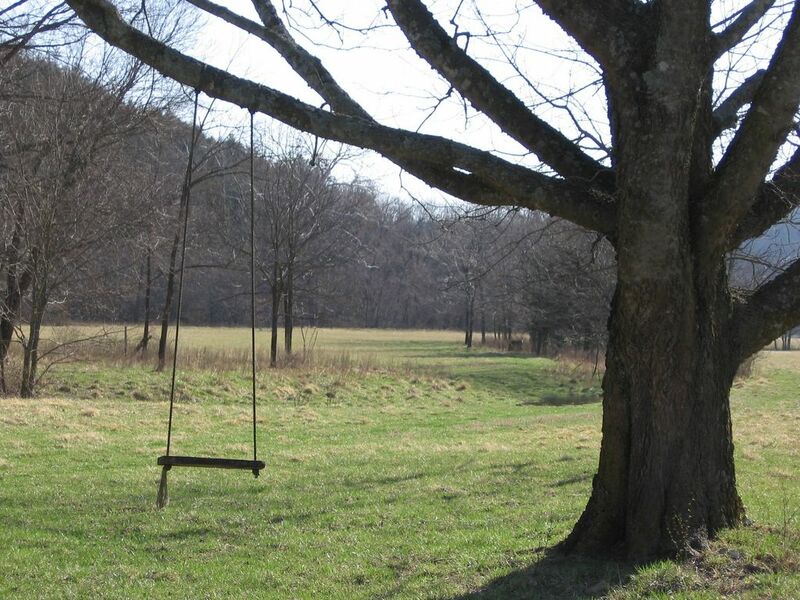 we were following a pro's advice), anyway, we now realize that he put that little swing bit in there as a big fat joke to see how many ignorant city slicker greenhorns he could get to actually build a swing for their chickens. A bit cruel, but you have to admit, pretty funny. I mean, we fell for it hook, line, and sinker. I do wish one of you would try using it though. While I had my camera with me, of course. Well now, if Whitey's going to appear on t-shirts,she might consider performing some daring chicken stunts of that nature. What would it say on the shirts, like "This is some swingin' chick", or like that? (I can hear Whitey over there singing, "Fame..I'm gonna live forever...") She does a cute little dance, too. "Funky Poultry" or something she calls it. BTW, I'm her manager, so you can take it up with me.